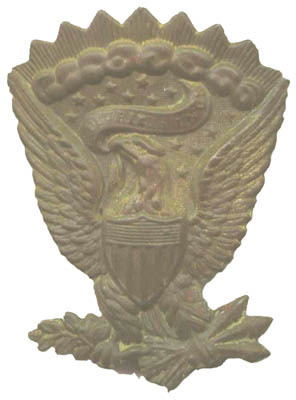 This insignia was used to loop the side of the dress hat up. It was originally introduced in 1851 as a pompon eagle, attached to the base of the pompon holder in the front of the 1851 cap (shako). With the a adoption of the hat by the entire army in 1858 the metal plate was reused to loop the side of the hat up. Officers used an embroidered version of the insignia but it was not commonly worn in the field. The above example was excavated at a Civil War site.